Why would I need self storage in Carson, CA? There are a variety of reasons why you might need self-storage in Carson, CA. How much is a storage unit in Carson, CA? The cheapest storage unit in Carson, CA is $55.00 per month. What size storage units do you have available in Carson, CA? In Carson, CA we have sizes that range from 4'x4' to 10'x30' to suit your storage needs. How much is it for a 4'x4' storage unit in Carson, CA? The cheapest 4'x4' storage unit in Carson, CA is $55.00 per month. Carson is a growing city in Los Angeles County and one of the youngest in its region. It offers a culturally diverse community and access to numerous amenities, including 120 acres of parkland, shopping and extensive sports and recreational facilities. Home to California State University, Carson has many of the features of a college town. 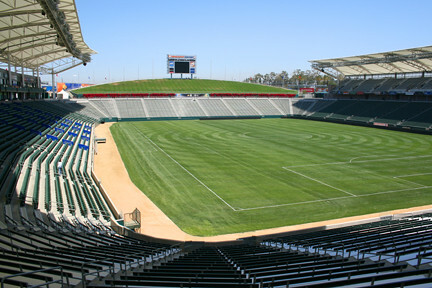 The StubHub Center sits on 125 acres on the university campus and houses a large stadium for soccer, football and concerts. Carson is well within a short drive to Los Angeles, making it easy to access big-city fun while still enjoying a quiet suburban lifestyle. Carson got its start as an oil drilling site in the 1920s, the first time drilling had been on Dominguez Hill. Mineral rights to the land were split among several different families and entities. By the mid-1920s, the local oil industry had really expanded, and a large number of refineries, tank farms and industrial complexes spread throughout the area. As Carson flourished, so did its population, nearly doubling between 1960 and 1970. You'll find plenty of benefits to calling Carson home. You can enjoy easy access to fresh local produce, food and handcrafted goods at the weekly SouthBay Pavilion Farmers Market. The SouthBay Pavilion Mall features over a million square feet of shopping space that includes several big-box retailers and nearly 100 different specialty stores. If you're a history buff, you can explore the International Printing Museum in Carson. A variety of sporting events and concerts take place at the city's StubHub Center, and professional sports teams the Los Angeles Galaxy and the Los Angeles Chargers both call Carson home. If you're planning to search for a job in Carson, it's good to know that job growth is on the rise. Carson is known primarily as an industrial center, with a variety of local jobs in sales, administrative support, production, transportation and material moving. If you'd prefer, you can make the short commute to Los Angeles to access jobs in a variety of industries. Carson is part of the Los Angeles Unified School District and has several highly-rated schools. The California Academy of Math and Science is located in Carson on the California State University, Dominguez Hills campus, and there are a few other private and charter schools in the area. If you're planning to pursue higher education in Carson, you'll enjoy convenient access to California State University, Dominguez Hills. Utilities: Your main energy providers in Carson will be Southern California Edison and Southern California Gas. The California Water Service Company and Golden State Water Company split the management of water and sewer services in the city. Garbage and Recycling: You'll receive three waste disposal carts to separate trash, recyclables and yard waste for curbside collection. Transportation: You can utilize the public shuttle and bus system to get around the city as well as to access other parts of the Los Angeles metropolitan area. The median home price in Carson is about average for California, though it's much higher than the national average. Home prices have been rising dramatically in the area, which could offer the opportunity to make a smart investment. Our lowest priced units in Carson, CA average $73.11 per month. 742 people have reserved units in Carson, CA in the past 30 days. There are 9 locations within Carson, CA's city limits. There are 2 locations in Carson, CA that offer AC and Heating features.